Maureen Brase-Houchin is the founder and director of Kokyo Taiko, Nebraska's only Wadaiko (Japanese style drumming) performance group. Trained in Japan, she has taught this heart-pounding cultural art for over 20 years to students and people of all ages, experience levels, cultural backgrounds, and abilities, including deaf students and those with physical limitations. Residency participants will learn about the history, traditions, construction, care, and maintenance of the taiko, as well as form, stance, technique, rhythms, Japanese language, and performable songs. 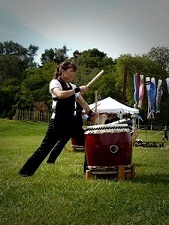 Her passion for sharing her heritage and her love of taiko has been enthusiastically received by audiences and students throughout the region. It has been an unexpected dream come true for her to be able to establish and maintain Wadaiko here in the Heartland. Feel deep within your soul why we are attracted to this primal heart beat, our first memory while in the womb.